Brooklands Mini Day, Weybridge, Surrey, KT13 0SL, 22nd March. An event that has always attracted lots of support from "Mokers" and is a great family day out!...The organisers have reserved a special place for the Mokes, to celebrate the Mokes 50th Anniversary...in the "Paddock", the most prestigious arena at Brooklands! and the most veiwed!!! ....So if you want to be involved....then let me or Chris Naish know....also...if you would like to attend the Austin/Morris day on the 9th of March....then you can take advantage of Brooklands "2 for 1" offer. IE....if you book for both...then you will only pay for 1!! !..Let us know ASAP...and we'll sort you out!....Get involved and be part of "Moke History!"....Andy. check, if it possible, for me ticket for Brooklands Mini Day 22nd March. Weske....pay on the day...look forward to seeing you there.....& hopefully the weather on the day will be much kinder than it was last March!!! Andy. Better weather ... Why you think ? I pay just at the entrance ? If you remember Wes... Last year it was extremely cold!! !, with snow flurries!! !.....Hopefully this year we will enjoy much better weather....& yes....just pay on the day. Regards, Andy. is there back a club stand in Brooklands ? Hi Wes, yes, there is a club stand...we have been given the most prestigious position at the event...ie. "The Paddock"..We are located at the epicentre of Brooklands!...We are the "Stars" of the show!...So....to all of you Mokers out there...make the effort....there is so much to see for all the family! !...You can take the kids & family on to the world's first "SuperSonic" passenger plane.."Concorde",....or you can take them back to the past and show them the planes & pilots that secured our independence. There is aslo a "Transport Museum" with vehicles from...horse drawn to petrol! 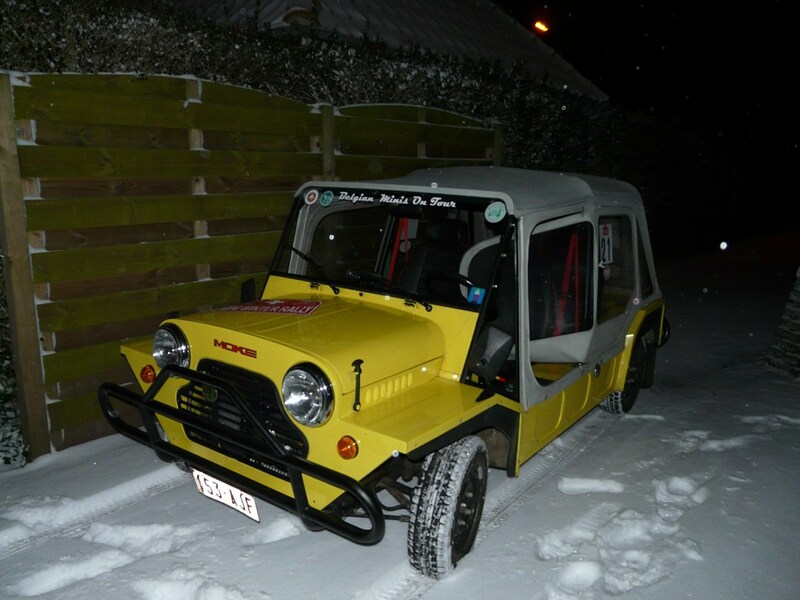 !...If you you want to access spare parts for your Moke..then there are numerous stalls to accommodate you...This year celebrates the 50th Anniversary of the MiniMoke....let's make it a "Special" one by attending this years "Brooklands" event. Andy. The "Moke Season" starts here!!!! Lindandy wrote: The "Moke Season" starts here!!!! ok we come with P&O. Only 34,50€ return ticket ! I think we are on the event between 11u. We are at 9u10 in Dover. Leave our home in the dark, 05u30. Kate and I will be be traveling down south for this event . Will be great to meet up and chat about plans for the rest of the year. Hi all, I have today received from Donna Hopton, Events Manager for the Brooklands Museum, our Mini Day Club Stand Passes, plus our stand details. We are located in area "T, RED" just outside the club house. You will be directed there by the marshals on the day. Entrance is via Entrance 2, Campbell Gate. which is off the B374 Brooklands Road, which will be sign posted "Minis Only". The post code is KT13 0QN. Entry is from 8am only & all participants must be on site before 11am. Look forward to seeing a record turnout for this great event. Andy. no engine for the moment in the Moke ... also i need to the MOT ..
Hope you can make it as I have an exhaust for you from Graham.